On September 3, The Equiery lost a member of our family when staffer Anne Moe passed away after a brief battle with late-onset amyotrophic lateral sclerosis (commonly known as ALS or “Lou Gehrig’s disease”). Where to begin with Anne? Not with the usual, formulaic obit. She was our Annie. I have known Anne for 25 years. She was one of the first women to embrace me in the world of foxchasing – and she had the “certain something” that all the young women in the club wanted to emulate – and single men wanted to date! A physical combination of Mary Martin and Sandy Duncan, with a Mary Tyler Moore smile that lit up the world – who wouldn’t want to be Anne or be with Anne? Anne made everything fun, and made everyone seem wonderful and feel wonderful. The embodiment of je ne sais quoi, wearing a Norwegian sweater with mittens, drinking a Stroh’s Light instead of champagne! Our world has dimmed a little bit. Born September 25, 1938 to Harry and Esther Larson of Scarville, Iowa, Anne Marguerite Moe (née Larson) began a lifetime love affair with horses on the family farm with the workhorses, riding aboard the drafts as they returned home from the field. She taught a blind pony to jump – and then, ever the imp, rode him up the steps of her one-room schoolhouse! Anne and then husband Paul Moe moved to Howard County, Maryland in 1964; they had three sons (Tony, Bennett and Peter). Anne was a founding member of the Central Maryland Saddle Club (1967), and in 1972 she founded the Centaurs 4-H Club, hosting shows at her Lisbon farm to foster the development of the next generation of riders. She joined the Howard County Hunt Club in 1974, actively hunting until the late 90s, but staying active through this year as a volunteer behind the scenes, helping to proofread materials for the club. When she was in her 50s, Anne also did something that most horse woman only dream of doing: she designed and built a small three-acre farmette just for herself and her few horses, designed such that she could not only manage, economically and physically, by herself, and which would allow her to age in place. A precursor to the current trend for “tiny houses,” Anne’s small, cleverly designed one-story, two-bedroom home was featured in the Baltimore Sun’s “Dream Home” column. For friends and family, Anne’s home was the enclave for gatherings, laughter and music wafting through her leafy glade. Tired of the obligatory mechanical rendition of “Happy Birthday?” Not with Annie! Pick a genre! Opera, jazz, reggae, Gregorian chant! And who doesn’t picture an idyllic Christmas afternoon with friends and family gathered around the piano singing carols? 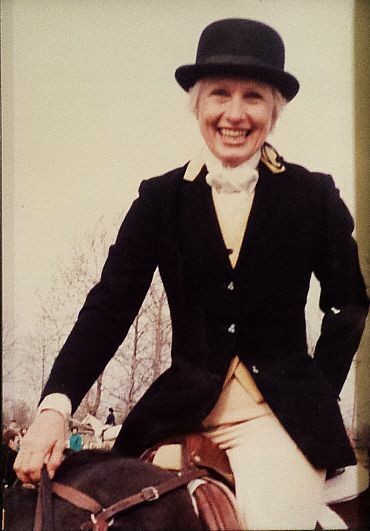 In the late 80s, Anne enjoyed a brief marriage to fellow Maryland foxhunter Bob Benhoff, but soon returned to her single ways, continuing to foxchase and turning her focus to her favorite breed, the Connemara Pony. 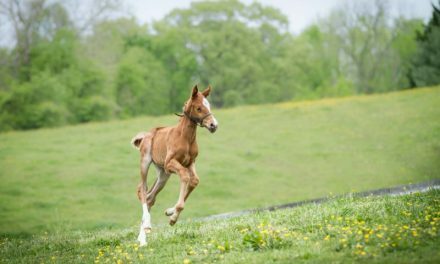 She brought promising yearlings through her “kindergarten” to produce future champion show ponies and able hunters, including her beloved Oakfield Colin Finch and Ridgetop Windy City. Anne served the American Connemara Pony Society tirelessly as Membership Chair, newsletter editor and Region III Show Secretary. In 2015, Anne became the first non-breeder to be awarded the prestigious Crestwood Award for service to the Society. When she wasn’t fooling with the horses, she was fooling with books and words, ultimately becoming one of the most important “behind the scenes” players in publishing: the proofreader! She was Norman Fine’s secret weapon when he was publishing Covertside, and she was certainly our secret weapon at The Equiery – and we don’t know what we will do without her. She became part of our team in 2010, joining us in our road trips, bringing her world-famous rum cakes to the office, knitting treasures for us at Christmas, and keeping us warm with her mulled wines and ciders. 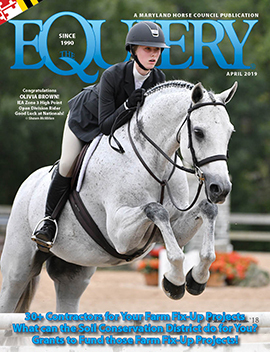 Of course, her editing career extended beyond the horse world, and she was also generous with her time and skills in our world, serving as the volunteer newsletter editor and publisher for numerous clubs. When she was not creating with words or music, Anne created with her knitting needles, effortlessly turned out mittens, hats, scarves and sweaters family and friends and to be sold for the benefit of her favorite organizations, and routinely won blue ribbons at local fairs. Anne faced everything in life with a cheerful pragmatism – no drama. Anne refused to be troubled by a diagnosis of breast cancer; she had the mastectomy and then kicked on, going about the business of living and doing the things she loved. The same held true for the diagnosis of ALS in 2016; she dug in, read everything she could about the diagnosis and prognosis, carefully planned out her remaining months, and provided guidance for the months after. Even while her physical abilities declined, Anne maintained a lifeline to the world through language, continuing her proofreading for The Equiery, continuing to devour whole books in a single sitting, and maintaining lively communications with extended friends and family via the modern marvels of email. As she had planned oh-those-many-years ago, Anne was able to stay in the home she so cherished, surrounded by the family she had so lovingly cultivated. Anne…not only is The Equiery better for having known you…we are better for having known you. Thank you for gracing our lives. Rest in peace. Thank you to Anne’s sons for their help, and thank you for sharing your 4-H and horse show memories and sharing a piece of your childhood with your extraordinary mother.